Giving special thanks to Eastern Mennonite University special collections librarian Simone Horst for her digitalization help, the Library of Virginia’s Virginia Chronicle website has launched a fully searchable run of the music journal, The Musical Million: A Journal of Music, Poetry, and Chaste Home Literature. EMU’s collection of The Musical Million is just one of many treasures of musical history to be found in the Menno Simons Historical Library. The Musical Million spread the Gospel of congregational shape-note singing far and wide and laid the groundwork for the proliferation of singing schools across the South. It was published by the Ruebush-Kieffer Company. Aldine S. Kieffer was the grandson of the Mennonite musician Joseph Funk. He and his partner Ephraim Ruebush took over Funk’s publishing company after his death. A recent Library of Virginia blog post shares some of the history related to Funk’s Harmonia Sacra, still in use by Mennonites today. Funk also adapted and popularized the seven-shape note system of Jessie Aiken, which stood in contrast with the older four-note system favored by adherents to the hymnal ‘The Sacred Harp.’ Fierce wars of words broke out in the late nineteenth century between advocates of each system, and Aldine S. Kieffer was a key soldier in the fight. By the late nineteenth and most of the twentieth century, seven-shape books were the standard in most of the South. The Ruebush-Kieffer Company moved from Singers Glen to Dayton, Virginia in 1878. 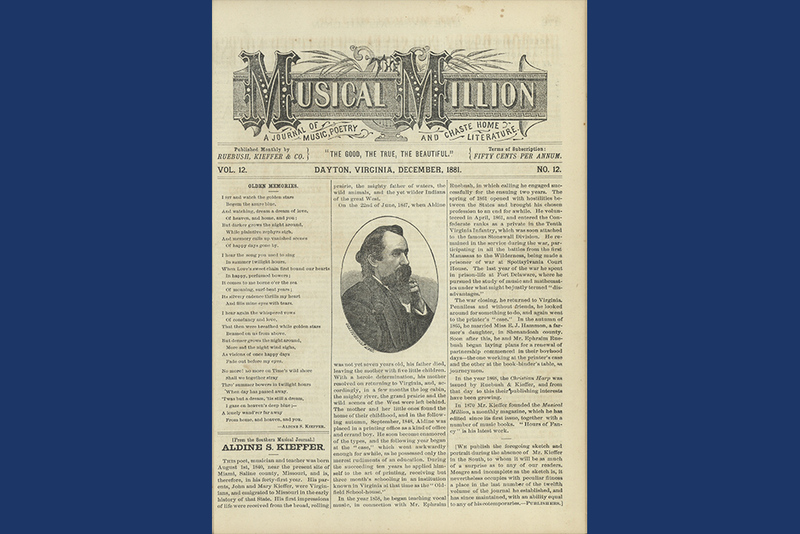 Sales of The Musical Million supported other proselytizing materials, including songbooks, and the company’s Virginia Normal Music School, founded in 1874 in New Market, Virginia, for the instruction of teachers. The Menno Simons Historical Library has cultivated an extensive collection of both Joseph Funk and Ruebush-Kieffer materials due to their connection and contribution to both Mennonite and Shenandoah Valley history. In addition to a nearly complete collection of songbooks published by both Funk and Ruebush-Kieffer, the collection includes Aldine Kieffer’s pump organ, Joseph Funk’s writing chair, and original printing plates used to print the 16th edition of the Harmonia Sacra.